Jeremy Fritz (born December 15, 1979) is a Canadian professional wrestler and television personality. 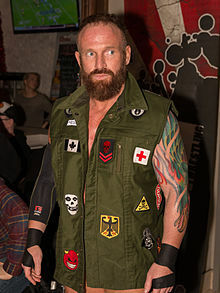 He is currently signed to WWE, where he performs on the Raw brand under the ring name Eric Young; he was also the leader of the stable Sanity. Young previously competed in WWE's developmental territory NXT, where he was a former NXT Tag Team Champion. Young appeared on WWE television three times. The first was on an WWE Velocity; he teamed with future tag team partner Bobby Roode and were defeated by Chuck Palumbo and Johnny Stamboli. The second appearance was also on WWE Velocity in which he was announced as "Showtime" Eric Young; he lost to Sean O'Haire. He appeared the next day on WWE Sunday Night Heat, losing a match to Val Venis. After the debut of TNA on Spike TV in October 2005, Young adopted a new character who was highly paranoid and afraid of almost anything and anybody. The character was introduced at the mock funeral staged by Planet Jarrett for Team 3D on the October 15, 2005 Impact!, when Young was startled after Abyss crushed a box of tissues that were offered to him, and then speculated that the funeral parlour was haunted by a ghost named "Katie", a tongue-in-cheek reference to the WWE "Katie Vick" storyline. The simplest things began to frighten Young, including the pyrotechnics that accompanied Team Canada's entrance. The character drew comparisons to South Park characters Tweek and Butters, and was often used for comic relief. During an interview about the World X-Cup by SoCal Val during TNA Global Impact!, Young stated "Foreigners frighten me. They're from other countries, and I don't know how to deal with that". On the February 28 edition of Impact!, Young lost the Beer Drinking Championship in a ladder match to James Storm. Young then participated in a feud with Rellik, losing to Rellik on Impact!. This then led to a match at Destination X with Young teaming up with Kaz to defeat Rellik and Black Reign in a tag match. It was at this pay-per-view that Young debuted a new superhero gimmick under the name "Super Eric", which was supposed to be his alter-ego. At Lockdown, he and Kaz won "The Cuffed in a Cage" match to earn a future Tag Team Championship match. On the April 17 Impact!, Young (who left the match and returned as Super Eric) and Kaz won the World Tag Team Championship, but later in the night were stripped of the titles due to Young not admitting he was Super Eric. On the May 1 Impact!, he teamed up with A.J. Styles, who was desperately looking for a partner backstage, and won against The Rock 'n Rave Infection. He and Styles went to Sacrifice, as part of the Deuces Wild Tournament to crown new Tag Team Champions, but lost to the eventual winners The Latin American Xchange. Young started a gimmick where he would look around the streets of Memphis, Tennessee for Elvis. The gimmick took a hiatus at Slammiversary, after Awesome Kong attacked a fake Elvis impostor. He revived the Super Eric gimmick on the July 17 Impact! and joined Curry Man and Shark Boy as part of a Justice League parody, called "The Prince Justice Brotherhood", which was at the same time making fun of the former ring name of TNA wrestler Abyss. At Bound for Glory IV, Super Eric competed in a Steel Asylum match, which was won by Jay Lethal. On March 20, 2009, Young appeared on Danny Bonaduce's morning radio show on WYSP in Philadelphia where it was announced that the two of them would wrestle each other at Lockdown. Young bad-mouthed Bonaduce and slapped him twice in the face before being pushed out of the room. At the Lockdown pre-show, Young defeated Bonaduce. After the bout, Bonaduce attacked Young before Rhino came to the ring to aid Young and then hit the Gore on Bonaduce. Young began to show frustration over losses to the likes of Sting and Jeff Jarrett. On the May 28 Impact!, Young turned heel after attacking Jarrett, who had just defeated him in a King of the Mountain qualifying match. The following week he confronted Jarrett and made implications to him paying more attention to wrestling than to his daughters just like his father, which led to Jarrett slapping him and starting a brawl. The following week Young's good friend Jeremy Borash confronted him in an interview which resulted in Young slapping JB down. At the Slammiversary pre-show, the heel turn was signified even further when he walked out on his tag team partner Rhino in a match against The British Invasion of Doug Williams and Brutus Magnus. His rivalry with Rhino would continue until Young defeated Rhino after a distraction from Rhino's protege Jesse Neal. He would then be chosen by Kurt Angle to be the special guest referee in a 3-way match where Angle faced Jeff Jarrett and Mick Foley. Throughout the match he would perpetually slow count all of Jarrett's pinfall attempts and at the end of the match when Angle locked the ankle lock on Foley he ordered for the bell to be rung even though Foley did not tap out or pass out. After the match, Young got beaten down by Jarrett. On the July 23, 2009, edition of Impact!, Young apologized for his crude remarks and personal issues with Jeff Jarrett, and wished Mick Foley best of luck in his match against Kurt Angle that night for the ownership of TNA and stated "If you lose TNA, I lose TNA. If I lose TNA, I lose everything." Foley allowed Young to join the team of A.J. Styles, Daniels, James Storm, and Robert Roode to face the British Invasion, Kiyoshi, and Sheik Abdul Bashir in a ten-man tag team match. However, in the conclusion of the match, he turned on the TNA originals by hitting Styles with a spike piledriver and allowing him to be pinned. Eric Young then became leader of a new faction named World Elite, consisting of himself (representing Canada), Bashir (representing Iran), Kiyoshi (representing Japan), and The British Invasion (representing the UK). The following week, Young helped Doug Williams and Brutus Magnus win the IWGP Tag Team Championship from Team 3D. On the August 6 Impact! it was revealed that Kurt Angle and Eric Young had made a deal to turn the Main Event Mafia and the World Elite factions into one super faction. That same night Young debuted a new look shaving his head and wearing new attire in a match where he defeated Daniels. On the September 10 edition of Impact!, World Elite recruited Homicide (representing Puerto Rico) into their group, turning him heel in the process. On the October 1 edition of Impact! the alliance between World Elite and Main Event Mafia came to an end in an all out brawl between the two factions. At Bound for Glory Young pinned Kevin Nash in a three-way dance, which also included Hernandez, to win the TNA Legends Championship. On the October 29 edition of Impact!, Young made his first title defense, losing to Bobby Lashley by disqualification. After the match, Young renamed the Legends Championship to the "TNA Global Championship" and claimed he would not defend it on U.S. soil or against any American wrestler. On the November 19 edition of Impact! Kevin Nash congratulated Young on outsmarting him the previous month and joined World Elite. On January 27, 2010, Young lost the Global Championship to World Elite teammate Rob Terry at a house show in Cardiff, Wales. Since the beginning of 2010 World Elite has not appeared together and the only sign of there still being an alliance between its members, apart from the British Invasion, has been Young teaming up with Kevin Nash on the January 21 edition of Impact! in a losing effort against The Nasty Boys. On the February 11 edition of Impact! Young started showing signs of a face turn after standing up for Kevin Nash after The Band of Scott Hall and Syxx-Pac had turned on him the previous week. The following week Young and Nash brawled with Hall and Syxx-Pac and on the March 8 edition of Impact! Young defeated Syxx-Pac in a singles match, solidifying his status as a face. At Destination X Young and Nash faced Hall and Syxx-Pac in a tag team match, where the Band's TNA futures were on the line. In the end Nash turned on Young and helped the Band pick up the victory, which finally gave them contracts with the company. On the March 29 edition of Impact! Nash offered Young a spot in the Band, claiming that what happened in Destination X was just business and nothing personal. Young refused the offer and in the main event of the evening, teamed up with Rob Van Dam and Jeff Hardy to defeat the Band in a six-man tag team steel cage match. At Lockdown Nash defeated Young in a steel cage match. On the May 3 edition of Impact!, Young turned heel once again by turning on Team 3D and joining The Band. The following week Nash cashed in his "Feast or Fired" contract and teamed with Hall to defeat Matt Morgan for the TNA World Tag Team Championship  Nash named Young one third of the champions under the Freebird rule. At the June 14 tapings of the June 17 edition Impact! The Band was stripped of the Tag Team Championship, due to Scott Hall's legal problems. The following day it was reported that Hall had been released from his contract with TNA. On the June 24 edition of Impact! Young and Nash decided to part ways, as Nash intended to go after Hogan, whom he blamed for what had happened to Hall and Waltman, and did not want Young to get into trouble for it. At the July 12, 2010, tapings of Xplosion, Young made his return to singles competition, losing to Suicide. In the finish of the match Young took a bump on his head and on the July 29 edition of Impact! he re-emerged as a face, returning to his comic relief roots with a gimmick of a mentally challenged person, teaming with Orlando Jordan and costing him their tag team match against Ink Inc. (Jesse Neal and Shannon Moore), after throwing a mannequin in the ring, which he had first tagged into the match. The following week Young's antics provided a distraction, which cost Jordan his match against D'Angelo Dinero. Young kept teaming with Jordan the following months, appearing exclusively on Xplosion, before returning to Impact! on the October 7 live edition, where they defeated Ink Inc., after a low blow by Jordan. However, after the match Young announced that they were forfeiting the match due to the finish and suggested they set up a rematch at Bound for Glory. In storyline, Young's mental issues made him completely unaware of Jordan's bisexual orientation and interest in him. At the pay-per-view Young's antics cost him and Jordan the match against Ink Inc. On the November 4 edition of Impact! Young and Jordan were featured in a segment, where they tried to get help from a specialist to improve their relationship with one another. This ended up being Fritz's final appearance for the company on his old contract, which expired shortly thereafter. On November 12 it was reported that Fritz had re-signed with the promotion. Young and Jordan returned to Impact! on December 16, defeating Generation Me (Jeremy and Max Buck) in a tag team match. Prior to the match Young appeared with the old TNA World Heavyweight Championship belt, which had been thrown away by Immortal, when they introduced the newly designed version of the belt. The following weeks, Young kept walking around with the belt, claiming to be the World Heavyweight Champion. On April 17 at Lockdown, Young and Jordan were unsuccessful in becoming the number one contenders to the TNA World Tag Team Championship in a four tag team steel cage match, which was won by Ink Inc.
On the May 12 edition of Impact!, Young took part in a number one contender's battle royal. After eliminating TNA Television Champion, Gunner, Young jumped out of the ring and left the arena with his title. On May 17 at the tapings of the May 26 edition of Impact Wrestling, Young admitted that he had mistakenly taken Gunner's title and agreed to lie down for him in the ring, but ended up double crossing him and pinning him to win the TNA Television Championship, the title formerly known as the TNA Legends and Global Championship, for the second time, which made him the second person to hold the title under all three of its incarnations. On July 10 at Destination X, Young teamed with the returning Shark Boy to defeat Generation Me in a tag team match. As the new Television Champion, Young started a storyline, where he claimed that the title could only be defended against television stars, making a challenge towards American Gladiators alum Matt Morgan and "defending" the title against TNA producer and former cast member of The Wonder Years, Jason Hervey, in a backstage assault, before embarking on a several-week-long trip to Hollywood to find Scott Baio. The trip culminated in a comedy segment on the August 25 edition of Impact Wrestling, where Young pinned Baio to, in his mind, successfully defend the Television Championship. Young returned to in-ring action on the September 8 edition of Impact Wrestling, when he successfully defended the Television Championship against Robbie E. After another successful title defense against Robbie on the October 27 edition of Impact Wrestling, Young was attacked by both Robbie and his bodyguard Rob Terry, which led to him announcing that he was going to bring Ronnie from the television show Jersey Shore to face them the following week. On November 1, Young became the longest reigning TNA Television Champion in history by breaking the previous record of 167 days, held by Rob Terry. On the November 3 edition of Impact Wrestling, Young and Ronnie were attacked by Robbie E and Rob Terry, which led to a tag team match the following week, where Ronnie pinned Robbie for the win. On November 13 at Turning Point, Young lost the Television Championship to Robbie E, following interference from Rob Terry, ending his reign at 180 days. On December 11 at Final Resolution, Young failed to recapture the title from Robbie E in a rematch. On the December 22 edition of Impact Wrestling Young teamed up with ODB in the Wild Card Tournament, advancing to the semifinals after a win over Anarquia and Shannon Moore. The following week, the team was eliminated from the tournament by Magnus and Samoa Joe. After this loss, Young would pursue a storyline relationship with ODB and the two would begin a feud with Angelina Love and Winter. Young and ODB defeated Love and Winter in a tag team match on the January 26 edition of Impact Wrestling. On the March 8 Impact Wrestling, Young and ODB defeated Gail Kim and Madison Rayne to win the TNA Knockouts Tag Team Championship, making Young the first male wrestler to have held the title and the first wrestler to have held all of TNA's exclusive tag team titles; the NWA World Tag, TNA World Tag and TNA Knockouts Tag Team Championships. After the match, ODB accepted Young's marriage proposal. Young and ODB made their first title defense two weeks later, when they defeated Mexican America (Rosita and Sarita). Young's and ODB's wedding ceremony took place on the April 12 Impact Wrestling. Three days later at Lockdown, Young and ODB defeated Rosita and Sarita in a steel cage match to retain the Knockouts Tag Team Championship. On May 13 at Sacrifice, Young was defeated by Crimson in a singles match. Afterwards, Young took a hiatus from TNA to film his upcoming Animal Planet program. During the hiatus, Young and ODB became the longest reigning Knockouts Tag Team Champions in history by surpassing The Beautiful People's reign of 141 days on July 19. Young returned to TNA on the August 30 Impact Wrestling, reuniting with ODB after her match with Madison Rayne. Young made his in-ring return on November 11 at Turning Point, teaming with ODB to defeat Tara and Jesse in a non-title mixed tag team match. On the following Impact Wrestling, Young was defeated by Jesse in a singles match. The following week during the TNA Turkey Bowl, Young pinned Jesse in a three-way match, which also included Robbie E and forced Jesse to wear a turkey suit as part of the Thanksgiving theme. After the match, both he and ODB were ambushed by the Aces & Eights and they proceeded to injure Young by hitting his exposed ankle with a ball-peen hammer, while ODB was handcuffed outside the ring and forced to watch. Young returned on the February 28, 2013, episode of Impact Wrestling, being revealed as the final member of Sting's Lethal Lockdown team and attacking their opponents, Aces & Eights. On March 10 at Lockdown, Team TNA, consisting of Young, James Storm, Magnus, Samoa Joe, and Sting defeated Aces & Eights, consisting of Devon, DOC, Garett Bischoff, Knux, and Mr. Anderson in a Lethal Lockdown match, with Young pinning Knux for the win. On the June 20 Impact Wrestling, Young and ODB were stripped of the Knockouts Tag Team Championship by Brooke Hogan due to Young being a male, ending their reign at a record 478 days. The titles were then retired on June 27. On the September 19, episode of Impact Wrestling Young then returned to singles action when he defeated Robbie E. In September 2013, Young began working and teaming with Joseph Park. On the September 26, episode of Impact Wrestling Young along with ODB and Joseph Park defeated The BroMans (Jessie Godderz and Robbie E) and Gail Kim in a six-person mixed tag team match. At the Bound for Glory pre-show, Eric Young and Joseph Park competed in a tag-team gauntlet match for be the number one contenders to the TNA World Tag Team Championship later that night. However, after eliminating Bad Influence, the team was eliminated by The BroMans. Later, during the PPV, he was attacked by Bad Influence, but was saved by Abyss. On October 31, 2013 episode of Impact, Abyss came to the aid of Eric Young again after he was attacked by Bad Influence, and proved he is no threat to Eric Young. However, on December 5, 2013, Bad Influence revealed the Parks' Law Firm closed 15 years ago. Next week, Park and Young defeated Bad Influence. After the match, Young said to Park that he was Abyss. On December 26, 2013, Young booked a Monster's Ball match between Bad Influence and Park and gave Janice to Park. Joseph won the match when he turned into Abyss. On February 6, 2014, Abyss defeated Young in a Monster's Ball match. However, during the match, Young stripped Abyss' mask, revealing to Park that Abyss and Joseph are the same person. Abyss went on to turn heel as he aligned with Magnus. On March 27 episode of Impact Wrestling, Young lost to Samoa Joe by knockout/submission. On the April 10, 2014, edition of Impact Wrestling, after winning a battle royal earlier in the night to become number-one contender, Young defeated Magnus to become TNA World Heavyweight Champion for the first time in his career. The victory also makes Young the seventh Triple Crown Champion and the fourth Grand Slam Champion in TNA. The following week, Young successfully made his first title defense against Abyss in a Monster's Ball match. At Sacrifice, Young defeated Magnus in a rematch for the title. Proclaiming himself a fighting champion, he successfully defended the TNA World Heavyweight Championship against Bobby Roode on the following Impact Wrestling. On the May 8, 2014 episode of Impact Wrestling broadcast, Young and Roode agreed to have a rematch, but TNA Director of Operations MVP declined the match and promised World Heavyweight Champion Eric Young that he would reveal his opponent at June's Slammiversary event. MVP revealed himself as the opponent, which was shown when he attacked the champion. On May 15, Young challenged MVP for a match, which he agreed, but was disqualified when Kenny King attacked Young. Bobby Lashley pretended to help Young, but he speared him. On June 5, Young, Bully Ray, Austin Aries and Samoa Joe defeated MVP, Kenny King, Bobby Lashley and Ethan Carter III in a eight-man tag team First Blood match. As Aries and Joe had been among MVP's harshest critics, they were put in matches against MVP associates King and Lashley respectively in singles matches at the PPV. MVP was later injured and not able to compete at the PPV, TNA announced on their website Friday before the PPV, that the match will now be a three-way cage match for the title, with the winners of Lashley vs. Samoa Joe and Austin Aries vs. Kenny King qualifying for the match. At Slammiversary XII, Young successfully defended his TNA World Heavyweight Championship against Lashley and Austin Aries. On the June 19, 2014 edition of Impact Wrestling, Young lost the TNA World Heavyweight Championship to Lashley. On the July 3 episode of Impact Wrestling, Eric Young had a rematch but failed to regain the title. On March 19, 2016, TNA announced that Young would be leaving the company after 12 years. Though not under contract, Young returned to WWE on the May 4 episode of NXT by confronting recently crowned NXT Champion Samoa Joe. Young faced Joe in the main event of the evening and lost by submission. Fritz has hosted his own television program, Off the Hook: Extreme Catches, on the Animal Planet channel. After the first season ran successfully from July to September 2012, the show returned for a second season from June to August 2013. On April 26, 2014, Fritz announced that he would host No Limits, scheduled for May 30 on Animal Planet. The show ran for one season, beginning on May 30, 2014. The show consisted of Fritz taking part in various extreme sports and other activities. ^ a b c d e f g h i j k l m n o p q r s t u v "Eric Young Online World of Wrestling". ^ a b c "Eric Young". WWE. ^ Bishop, Matt (2011-06-03). "Impact: Karen Jarrett takes a fall, Foley gone". Slam! Sports. Canadian Online Explorer. Retrieved 2011-06-03. ^ Sokol, Chris (2008-02-29). "Impact: Angle takes down Nash". SLAM! Sports. Retrieved 2009-04-10. ^ Clevett, Jason (2008-03-10). "Destination X spotty at best". SLAM! Sports. Retrieved 2009-04-10. ^ Sokol, Chris (2008-04-13). "TNA Lockdown: Joe captures gold". SLAM! Sports. Retrieved 2009-04-10. ^ Sokol, Chris (2008-04-18). "Impact: New champs and nonsense". SLAM! Sports. Retrieved 2009-04-10. ^ Sokol, Chris (2008-05-02). "Impact: Double trouble". SLAM! Sports. Retrieved 2009-04-10. ^ Sokol, Chris (2008-05-12). "TNA Sacrifice: Joe retains; LAX regains". SLAM! Sports. Retrieved 2009-04-10. ^ Waldman, Jon (2008-06-08). "Slammiversary: No gimmicks needed for thumbs up PPV". SLAM! Sports. Retrieved 2009-04-10. ^ Sokol, Chris; Sokol, Bryan (2008-07-18). "Impact: Joe sends Booker for a ride". SLAM! Sports. Retrieved 2009-04-10. ^ "Danny vs. TNA's Eric Young". 94WYSP. Retrieved 2009-03-21. ^ Caldwell, James (2009-04-19). "CALDWELL'S TNA LOCKDOWN PPV REPORT 4/19: Ongoing "virtual time" coverage of all-cage PPV - Sting vs. Foley". PWTorch. Retrieved 2010-03-10. ^ Parks, Greg (2009-05-28). "Parks' TNA Impact Report 5/28: Ongoing "virtual time" coverage of the show, including new and returning faces". PWTorch. Retrieved 2009-12-21. ^ Keller, Wade (2009-06-04). "Keller's TNA Impact Take 6/4: Ongoing "virtual time" coverage and analysis of Spike TV program". PWTorch. Retrieved 2009-12-21. ^ Wilkenfeld, Daniel (2009-06-11). "TNA Impact Report 6/11: Ongoing "virtual time" coverage of Spike TV broadcast". PWTorch. Retrieved 2009-12-21. ^ Sokol, Chris; Sokol, Bryan (2009-06-22). "TNA Slammiversary shocks and surprises". Slam! Sports. PWTorch. Retrieved 2009-12-21. ^ Sokol, Chris; Sokol, Bryan (2009-07-03). "Impact: Sting to the rescue". Slam! Sports. Canadian Online Explorer. Retrieved 2009-12-21. ^ Boutwell, Josh (2009-07-10). "Impact Results 7/9/09". WrestleView. Retrieved 2010-02-12. ^ Boutwell, Josh (2009-07-24). "Impact Results - 7/23/09". WrestleView. Retrieved 2009-12-21. ^ Boutwell, Josh (2009-07-31). "Impact Results - 7/30/09". WrestleView. Retrieved 2009-12-21. ^ a b Boutwell, Josh (2009-08-07). "Impact Results - 8/6/09". WrestleView. Archived from the original on 2009-12-26. Retrieved 2009-12-21. ^ Sokol, Bryan; Sokol, Chris (2009-10-02). "Impact: Elite Mafia meltdown". Slam! Sports. Canadian Online Explorer. Retrieved 2009-10-02. ^ Wilkenfeld, Daniel (2009-10-29). "Wilkenfeld's TNA Impact Report 10/29: Ongoing "virtual time" coverage of Spike TV broadcast". PWTorch. Retrieved 2009-10-30. ^ Parks, Greg (2009-11-19). "PARKS' TNA IMPACT REPORT 11/19: Ongoing "virtual time" coverage of the post-Turning Point show". PWTorch. Retrieved 2010-02-12. ^ Gerweck, Steve (2010-01-27). "New TNA Champion crowned in Wales". WrestleView. Retrieved 2010-01-27. ^ Wilkenfeld, Daniel (2010-01-21). "WILKENFELD'S TNA IMPACT REPORT 1/21: Ongoing "virtual time" coverage of Spike TV broadcast". PWTorch. Retrieved 2010-02-12. ^ Caldwell, James (2010-02-11). "CALDWELL'S TNA IMPACT REPORT 2/11: Complete coverage of Spike TV show - final build-up to Against All Odds PPV". PWTorch. Retrieved 2010-02-12. ^ Wilkenfeld, Daniel (2010-02-18). "WILKENFELD'S TNA IMPACT REPORT 2/18: Ongoing "virtual time" coverage of Spike TV broadcast". PWTorch. Retrieved 2010-02-20. ^ Keller, Wade (2010-03-08). "TNA IMPACT RESULTS 3/8: Keller's live ongoing report covering the historic beginning of Monday Night War II". PWTorch. Retrieved 2010-03-10. ^ Keller, Wade (2010-05-13). "TNA Impact Results 5/13: Keller's live ongoing coverage of return to Thursdays, Jeff RVD vs. Hardy vs. A.J. Styles". Pro Wrestling Torch. Retrieved 2010-05-16. ^ a b Caldwell, James (2010-05-16). "Caldwell's TNA Sacrifice results 5/16: Ongoing "virtual time" coverage of PPV - RVD vs. Styles, Jeff Hardy vs. Mr. Anderson". Pro Wrestling Torch. Retrieved 2010-05-16. ^ a b Wilkenfeld, Daniel (2010-06-10). "Wilkenfeld's TNA Impact report 6/10: Ongoing "virtual time" coverage of Spike TV broadcast". Pro Wrestling Torch. Retrieved 2010-06-11. ^ Caldwell, James (2010-06-15). "TNA News: Scott Hall reportedly fired by TNA; SPOILERS on TNA tag title situation". Pro Wrestling Torch. Retrieved 2010-06-15. ^ Wilkenfeld, Daniel (2010-06-24). "Wilkenfeld's TNA Impact report 6/24: Ongoing "virtual time" coverage of Spike TV broadcast (updated)". Pro Wrestling Torch. Retrieved 2010-07-25. ^ Martin, Adam (2010-06-24). "Impact Results - 6/24/10". WrestleView. Archived from the original on 2010-06-27. Retrieved 2010-07-25. ^ Gerweck, Steve (2010-07-12). "Spoilers: TNA Xplosion tapings in Orlando". WrestleView. Archived from the original on 2012-09-24. Retrieved 2010-07-30. ^ Martin, Adam (2010-07-29). "Impact Results - 7/29/10". WrestleView. Archived from the original on 2011-07-18. Retrieved 2010-07-30. ^ a b Martin, Adam (2010-10-10). "Bound for Glory PPV Results - 10/10/10". WrestleView. Archived from the original on 2010-10-14. Retrieved 2010-10-11. ^ Wilkenfeld, Daniel (2010-11-04). "Wilkenfeld's TNA Impact report 11/4: Ongoing "virtual time" coverage of Spike TV broadcast". Pro Wrestling Torch. Retrieved 2010-11-09. ^ Martin, Adam (2010-11-09). "Report: Eric Young's contract with TNA expires". WrestleView. Archived from the original on 2010-11-13. Retrieved 2010-11-09. ^ Martin, Adam (2010-11-12). "Report: Eric Young re-signs with TNA Wrestling". WrestleView. Archived from the original on 2010-11-16. Retrieved 2010-11-13. ^ Wilkenfeld, Daniel (2010-12-16). "Wilkenfeld's TNA Impact report 12/16: Complete "virtual time" coverage of Spike TV broadcast". Pro Wrestling Torch. Retrieved 2010-12-19. ^ Caldwell, James (2011-05-12). "Caldwell's TNA Impact report 5/12: Ongoing "virtual-time" coverage of big reveals, final PPV hype, battle royal main event". Pro Wrestling Torch. Retrieved 2011-05-18. ^ Keller, Wade (2011-06-16). "Keller's TNA Impact report 6/16: Ongoing coverage of Slammiversary fallout on Spike TV". Pro Wrestling Torch. Retrieved 2011-08-19. ^ Boutwell, Josh (2011-08-12). "Impact Wrestling Results - 8/11/11". WrestleView. Archived from the original on 2011-08-25. Retrieved 2011-08-19. ^ Boutwell, Josh (2011-08-26). "Impact Wrestling - 8/25/11". WrestleView. Retrieved 2011-08-26. ^ Keller, Wade (2011-09-09). "Keller's TNA Impact report 9/8: Jeff Hardy returns, Anderson gets his title rematch against Angle, No Surrender final hype". Pro Wrestling Torch. Retrieved 2011-09-11. ^ Keller, Wade (2011-10-27). "Keller's TNA Impact report 10/27: James Storm's speech about winning World Title, Brother Ray vs. Jeff Hardy". Pro Wrestling Torch. Retrieved 2011-10-31. ^ Caldwell, James (2011-11-13). "Caldwell's TNA Turning Point PPV results 11/13: Ongoing "virtual time" coverage of live PPV - Roode-Styles, five title matches". Pro Wrestling Torch. Retrieved 2011-11-13. ^ Bishop, Matt (2011-12-23). "Impact: Sting, Hardy out for revenge". Slam! Sports. Canadian Online Explorer. Retrieved 2011-12-23. ^ Boutwell, Josh (2011-12-30). "Impact Results - 12/29/11". WrestleView. Archived from the original on 2012-06-29. Retrieved 2011-12-30. ^ a b Turner, Scott (2012-03-09). "Turner's TNA Impact Wrestling report 3/9: Garett & Hardy vs. Angle & Gunner main event, Anderson returns, Abyss's "brother" emerges, X Title match, one title change". Pro Wrestling Torch. Retrieved 2012-03-09. ^ Turner, Scott (2012-03-23). "Turner's TNA Impact Wrestling results 3/22: Victory Road fall-out, Dixie & Sting & Hogan close the show, three title matches". Pro Wrestling Torch. Retrieved 2012-03-23. ^ Turner, Scott (2012-04-13). "Turner's TNA Impact Wrestling results 4/12: Storm-Roode confrontation, ODB & Eric Young married in steel cage, final Lockdown hype". Pro Wrestling Torch. Retrieved 2012-04-13. ^ Caldwell, James (2012-05-13). "Caldwell's TNA Sacrifice PPV results 5/13: Ongoing "virtual time" coverage of live PPV - Roode-RVD main event, Angle-Styles, Hardy-Anderson". Pro Wrestling Torch. Retrieved 2012-05-14. ^ Gerweck, Steve (2012-06-24). "Eric Young addresses quitting TNA rumor". WrestleView. Archived from the original on 2012-06-27. Retrieved 2012-07-19. ^ a b "CALDWELL'S TNA IMPACT RESULTS 11/22: Thanksgiving Edition features Gut Checks, Turkeys, more". ^ "TNA IMPACT Wrestling RESULTS 9/26". ^ "TNA announces exit of two big names from the roster". Pro Wrestling Torch. Archived from the original on 2016-03-20. Retrieved 2016-03-20. ^ Parry, Josh. "4/28 WWE NXT TV Taping – Full SPOILER Results from Full Sail". Pro Wrestling Torch. Retrieved April 28, 2016. ^ James, Justin. "5/4 WWE NXT Results – James's Report on Samoa Joe, Austin Aries, Eric Young debut, more". Pro Wrestling Torch. Retrieved May 4, 2016. ^ Caldwell, James (2012-04-04). "TNA star gets Animal Planet TV show". Pro Wrestling Torch. Retrieved 2012-04-04. ^ Caldwell, James (2012-06-18). "Premiere date for Eric Young's new show". Pro Wrestling Torch. Retrieved 2012-06-18. ^ "NO LIMITS: Programs: Animal Planet: Discovery Press Web". Archived from the original on 2014-05-03. Retrieved 2014-06-12. ^ Paglino, Nick (2011-08-22). "New Bischoff Show Debuts Tonight, Melina Valets TNA Wrestler". Retrieved 2011-08-25. ^ Sokol, Chris (2006-12-29). "Impact: Angle gets his rematch against Mr. TNA". SLAM! Sports: Wrestling. Canadian Online Explorer. Retrieved 2009-09-29. This page is based on the Wikipedia article Eric Young (wrestler); it is used under the Creative Commons Attribution-ShareAlike 3.0 Unported License (CC-BY-SA). You may redistribute it, verbatim or modified, providing that you comply with the terms of the CC-BY-SA.